I’m a thirty-something bisexual man. Nowadays, I’m comfortable with my sexuality, but it wasn’t always this way. I used to feel ashamed and embarrassed that I was bisexual, and I hid my sexuality from others. I spent many years moving between straight and gay identities. I knew neither identity felt right to me, but I lacked the confidence to come out as bisexual. When I did pluck up the courage to come out to a few people as a teenager, I experienced biphobic reactions that sent me straight back into the closet. In my mid-twenties, I decided that I didn’t want to feel bad about being bisexual any more, and I started on a journey to a much happier place. 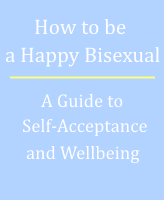 I want to explore that journey in my blog, looking at the factors that helped me build a sense of wellbeing and confidence with my bisexuality. I’ll write about the process of coming out, meeting people, relationships, dealing with intense emotional experiences and the range of challenges we face living in a generally unwelcoming society. I’d love to hear your experiences too, so please feel free to email me. I really hope that you’ll find this site useful.